Review by Nathan Hinkle, Sept. 24, 2016, 6 a.m. Complaints about blinding glare are increasingly common as bike lights get brighter and brighter. Getting 1000 lumens directly to the face is never fun, and yet most bike lights on the market today have circular beams which direct as much of the light towards oncoming people as they do towards the road. Not only is this a safety hazard and inconsiderate towards other road users, it's also a waste of light... if you weren't shining half your light into the trees and other people's eyes, your light wouldn't use as much power. Enter the Busch & Müller Ixon series. B&M is a leader in dynamo lighting, and their dynamo lights are widely recognized for having expertly crafted lenses which focus the light on the road and only on the road. Their battery-powered solutions aren't as well known, and were previously all bulky and rather unsightly products. The new Ixon Core series changes that. 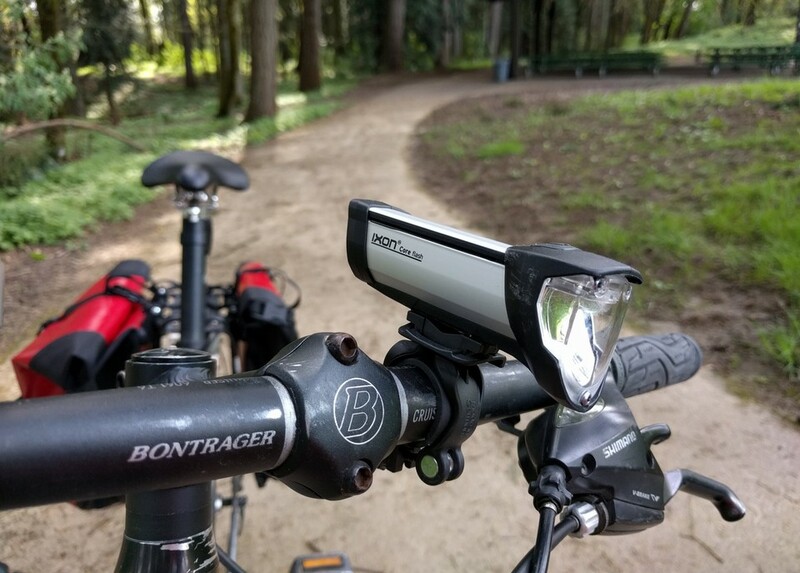 The series was recently refreshed with the addition of the Ixon Core Flash, a sleek, modern, rechargeable headlight which is as nice to look at as it is to see with. Before seeing it in person, it was difficult for me to gauge the size of this light from pictures. It turned out to be much sleeker and smaller than it appeared in pictures. The light measures 10 cm long. The battery compartment is about 3 x 3 cm, and the emitter optic is a bit larger, at 3.5 x 4.5 cm. The light weighs only 108 g.
The key feature of the Ixon Core is its custom optics design. The LED sits on the roof of the lens assembly, facing down. The output reflects off of a curved reflector which distributes the light evenly on the roadway. A small piece of translucent plastic shields the LED from directly shining out the front of the light, further reducing glare. The resulting effect is dramatic. The beam has a sharp cut-off above which very little light is cast, much like a car's low beams. I set the light on a counter at about handlebar level and then stood in the beam, and could look directly at the light without feeling uncomfortable. Looking directly at the beam of a different headlight in the same position with traditional circular optics and a forward-facing LED was painful. The optics spread the light evenly so that the road is illuminated consistently both far and near. In addition to the main LED, the Ixon Core Flash has a smaller forward-facing LED near the top of the lens assembly. 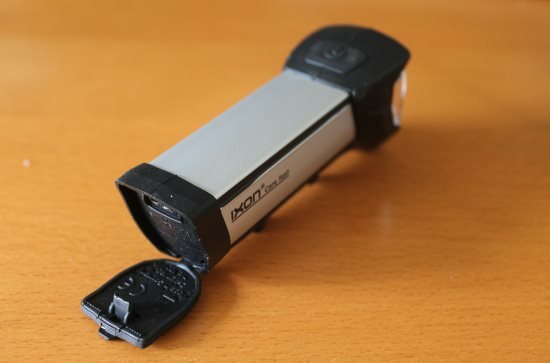 This is a smaller, lower-power LED which flashes in certain modes to increase visibility. In the flashing mode, both the main LED and the visibility LED flash together at a slow frequency, about 2 flashes per second. In high and low mode, the primary LED is continuously illuminated while the visibility LED can either be turned off, or can flash at the same slow rate. Flashing is a new feature for B&M lights; the original Ixon Core had no flashing option at all, while the Ixon Core Flash is an attempt to appeal to markets outside of Germany where flashing lights are more commonly used. While the physical design is excellent, I think the flash pattern options need improvement to compete against the most popular headlights in the US market. 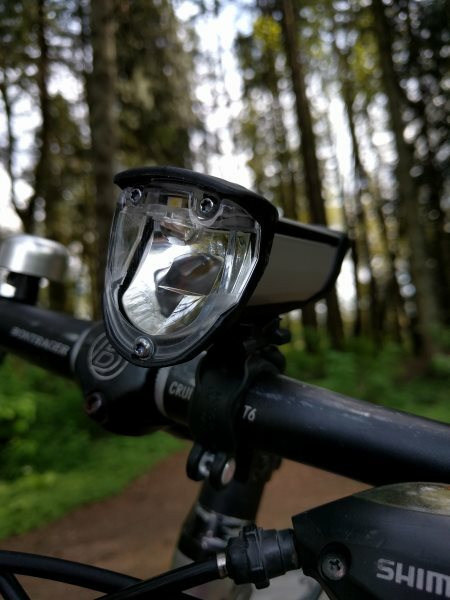 The slow flash of the primary LED isn't very attention-grabbing in broad daylight, making it less useful as a daytime running light compared to products like the Cygolite Metro or the Bontrager Ion 700 which have specific and attention-grabbing daytime flash modes. At night I prefer using the steady mode with the LED flashing. The small and slow-flashing visibility LED is overpowered by the much brighter primary LED. With a more rapid and attention-grabbing flash pattern it could be a very effective design though. I found it necessary to use the light in high mode most of the time when riding at night, especially if the pavement was wet. I'm not sure the output level in lumens, although lumens aren't a particularly useful comparison against traditional circular-beam lights. In high mode the amount of light hitting the street is comparable to a 300-400 lumen traditional light. For most urban riding high the output level is sufficient; however, on some steeper, faster descents I found myself occasionally outrunning the beam. I used the low mode only occasionally, such as when riding slowly or in very well-lit areas. The Ixon Core uses an integrated lithium battery, probably using an 18650 cell inside. The battery is not replaceable or accessible to the user, so you cannot swap batteries during your ride. It charges via a micro USB port on the back side of the light. The rubber port cap covers the entire back side, and I've had trouble getting it to stay closed sometimes after charging. The light does not support fast charging, so I typically plug it in and let it charge overnight as it does take several hours. In the FL1 Standard battery test, the Ixon Core lasted 4:30 hours before dropping below 10% of its initial output. The output was well-regulated for the first three hours, with the output dropping less than 10% by 2:50 hours. This is one of the advantages of a well-shaped beam: all of the output is being used efficiently because the light all actually shines on the road. That means less total output is required, making the LED cheaper and the battery last longer. The lower output required means the emitter doesn't get as hot, which in turn means it runs more efficiently. Win-win-win! I found the Ixon Core's mount very tricky to use, especially with gloved hands or when in a hurry. Whereas most lights slide into the mount's bracket from the front or back, this light slides in from the side. The light slides in from the right side, and a small tab on the left side releases the light when depressed. I often had trouble remembering which side the light is supposed to attach from, and found it difficult to line it up correctly. Difficulties aside, the mount is very secure once you manage to get the light into it. Positioning the light is very important due to the beam shape, and having a mount that doesn't budge unexpectedly ensures the light stays put once you get the angle just right. The handlebar clamp is tightened (somehow? ), so it is not quick and easy to move the light from one bike to another. I generally prefer a rubber strap mount like those found on the Light & Motion Urban headlights or the Serfas TSL headlights, but for this particular light the rigid mount is probably for the best due to the aforementioned need for precise aiming. A single button controls the light's operation, switching between high, low, high with flash, low with flash, and all flashing mode. The button requires a very firm press to register a click, and it can be difficult to switch with gloves on. This isn't a light you're likely to be changing modes of on the fly though, so it's not a big problem. There are very few lights available like the B&M Ixon Core. The Philips Saferide was previously popular as another headlight with a cut off beam, but it was discontinued last year. Specialized has recently released various headlights with a customized beam. I haven't had a chance to test those yet, but they look interesting albeit very expensive. Busch & Müller of course has several other headlight offerings with similar optical designs. The Ixon IQ is a bit older and uses 4x AA batteries instead of a single integrated lithium battery. The Ixon IQ is quite a bit heavier and bulkier than the Ixon Core, and while it is rechargeable it uses NiMH AA batteries which can't match modern lithium batteries for performance and longevity. The only compelling reason to choose the Ixon IQ over the Ixon Core is if you insist on being able to swap the batteries. I'm a big fan of quality optics, so naturally the Ixon Core is a new favorite of mine. I wouldn't use it for trail riding, but for urban cycling it's an excellent choice. No other light I'm aware of offers focused optics in a package this size and price. For people who need a bit more light output than the Ixon Core can provide, pairing it with a helmet light is a good solution. I almost always ride with the Light & Motion Vis 360+, which can add up to 250 additional lumens as well as 360° visibility. It's one of the few lights built for helmets from the ground up, which means the angle of its headlight can be adjusted on the fly to avoid blinding oncoming traffic. The Ixon Core paired with the Vis 360(+) is possibly the most adaptable and considerate urban/commuter bike light setups available. Unfortunately, it's very hard to find Busch & Müller products in the US. Peter White Cycles is the only US distributor I know of, and doesn't carry the Ixon Core Flash version, although they do sell the non-flash Ixon Core and a new, similar light called the Ixon Fyre.